Compact Comfortable mouse design . Sharpens knives and scissors . Magnetic back for easy storage . 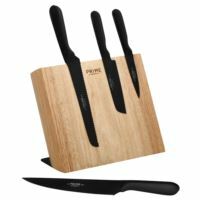 3.25" Parer, 3.5" Fruit/Vegetable Knife, 4" Spreader. 4.5" Utility, Multi-colored handles to help identify . Stainless steel blades resist stains and rust. 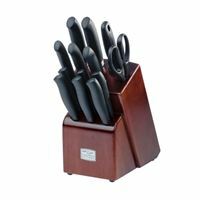 The contoured handles provide comfort and safety . 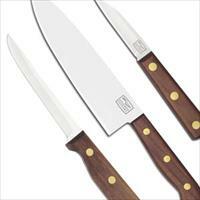 (2) 3" Paring, 5" Utility, 6" Chef, 8" Sharpening Steel. 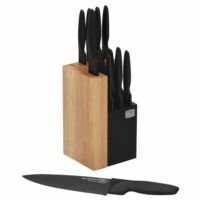 (8) 4.5" Steak Knives, Hardwood Block. High-carbon stainless steel resists rust and stains. Exclusive Taper Grind edge technology for optimum sharpness. Triple compression brass rivets. Full tang extends to the end of the knife. Hand-wash recommended. 3" & 3.25" Parers, 5" Utility, 6" Boning, 7" Santoku. 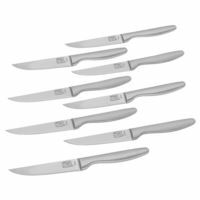 8" Bread, 8" Slicer, 8" Chef, (8) 4.5" Steak Knives. Shears, 18-slot Block with In-Block Sharpener . 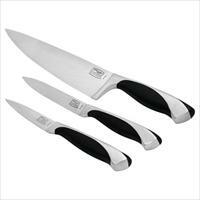 High-carbon stainless steel blades with full bolster. Stainless steel handles and sleek, contemporary styling. Elegant Satin finish, Full Lifetime Warranty . 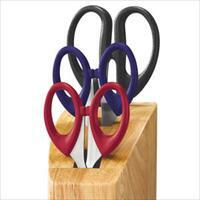 Herb Snips, Medium & Large Kitchen Shears, Storage Block. Stainless steel with multi-color poly handles . 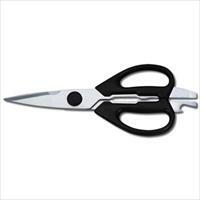 Multiple shears prevent cross contamination. Keeps your kitchen scissors organized. Lifetime Limited Warranty. 2.75" & 3.5" Parers, 4.75" Partoku, 5.5" Utility, 7" Santoku. 9" Scalloped, 8" Sharpening steel, (6) 4.5" Steak Knives. Shears, Hardwood 14-slot Block. High-carbon stainless steel blades with full tang. 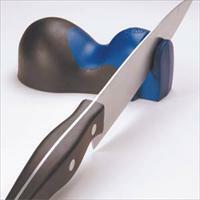 Polymer handles provide comfort and safety when cutting. Triple compression rivets; Full Lifetime Warranty. 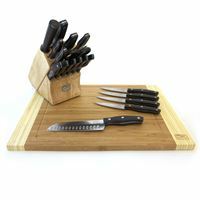 Premium bamboo construction that won't dull knives. Environmentally friendly - Bamboo is 100% renewable . Sleek surface is easy to clean - Hand washing recommended . Dimensions: 12x8x3/4". 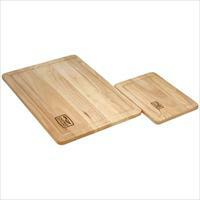 1-ea 10" by 14" and 6" by 8" Cutting Boards. Easy to clean, No mess juice groove. 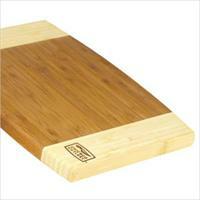 Reversible board reduces possible food contamination. Won't dull knives. 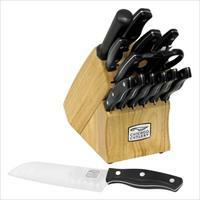 Premium bamboo construction that won't dull knives. 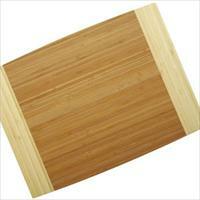 Environmentally friendly - Bamboo is 100% renewable . Sleek surface is easy to clean - Hand washing recommended . Dimensions: 12" x 16" x 3/4". 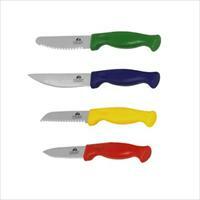 3" Peeling, 3.5" Paring, 4.75" Serrated Utility. 4.5" Serrated Fruit, 5" Partoku, 7" Santoku, 8" Bread. 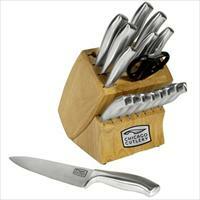 (6)- Serrated Steak Knives, Shears & Wood Block. Professional high-carbon stainless steel blades . Exclusive Taper Grind® edge technology - optimum sharpness. Classically designed poly handles. Full tang for balance & strength. Triple compression stainless steel rivets . 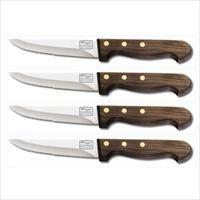 3-1/2" Parer, 4.75" Utility Knife. 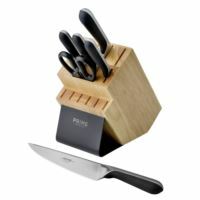 5" Partoku, 6" Chef, 4 Slot Block. Professional high-carbon stainless steel blades . Exclusive Taper Grind® edge technology - optimum sharpness. Classically designed poly handles. Full tang for balance & strength. Triple compression stainless steel rivets . 5" Partoku, 7" Santoku. Sheath Packaging for safety and storage. Professional high-carbon stainless steel blades . Exclusive Taper Grind® edge technology - optimum sharpness. Classically designed poly handles. Full tang for balance & strength. Triple compression stainless steel rivets . 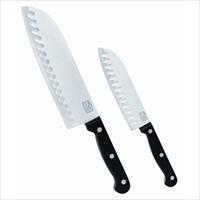 3-1/2" Parer, 4.75" Utility, 6" Chef. Sheath Packaging for safety and storage. Professional high-carbon stainless steel blades . Exclusive Taper Grind® edge technology - optimum sharpness. Classically designed poly handles. Full tang for balance & strength. Triple compression stainless steel rivets . 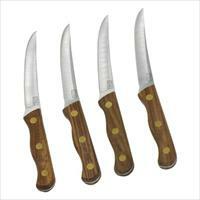 (4) 4.5" Serrated Steak Knives. Sheath Packaging for safety and storage. Professional high-carbon stainless steel blades . Exclusive Taper Grind® edge technology - optimum sharpness. Classically designed poly handles. Full tang for balance & strength. Triple compression stainless steel rivets . Sheath Packaging for safety and storage. High-carbon stainless steel resists rust and stains. Exclusive Taper Grind edge technology for optimum sharpness. Triple compression brass rivets. (4) 4.5" Steak Knives. Sheath Packaging for safety and storage. High-carbon stainless steel blades with full tang. Polymer handles provide comfort and safety when cutting. Triple compression rivets; Full Lifetime Warranty. 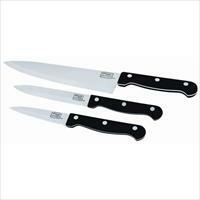 7.5" Chef, 5" Utility, 3.75" Parer. Professional high-carbon stainless steel blades. Polymer and stainless steel handles. Exclusive Taper Grind™ Edge. Full Lifetime Warranty. 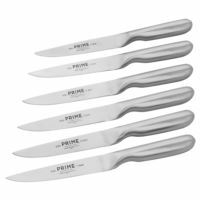 7.5" Chef, 7.75"Bread, 5" Utility, 3.75" Parer, 3.5" Peeler. 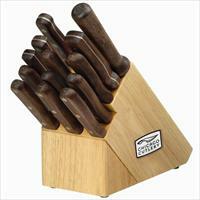 (8) 4.5" Steak Knives, Steel, Shears, Espresso Wood Block. Professional high-carbon stainless steel blades. Polymer and stainless steel handles. Exclusive Taper Grind™ Edge. Full Lifetime Warranty. 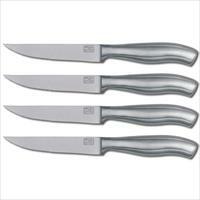 7.75" Chef, 8" Bread, 5" Utility, 3.5" Parer, 3" Peeler. Steel, Shears, (8) 4.5" Steak Knives, Espresso Wood Block. Professional high-carbon stainless steel blades. Polymer and stainless steel handles. Full metal tang provides added strength, balance and control. Exclusive Taper Grind™ Edge. Full Lifetime Warranty. 8" Chef, 8"Bread, 8" Slicer, (2)4" Parer, 3" Peeler. 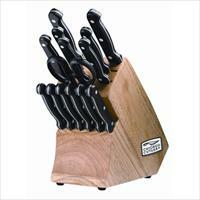 5.5" Utility, (6)4.5" Steak Knives, Shears, Cherry Wood Bloc. Professional high-carbon stainless steel blades. Polymer and stainless steel handles. Full metal tang provides added strength, balance and control. Exclusive Taper Grind™ Edge. Full Lifetime Warranty. 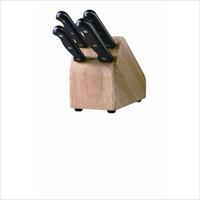 7.5" Chef, 8.75" Bread, 5" Utility, 3.5" Parer, 3" Peeler. Shears, Steel, (6) 4.5" Steak Knives and Cherry Wood Block. Professional high-carbon stainless steel blades. Soft grip handles for comfort and control. Exclusive Taper Grind™ Edge. Full Lifetime Warranty. 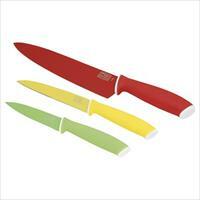 Red 7.5" Chef, Yellow 5" Utility and Green 3.5" Paring Knife. Professional high-carbon stainless steel blades. Soft grip handles for comfort and control. Exclusive Taper Grind™ Edge. Full Lifetime Warranty. 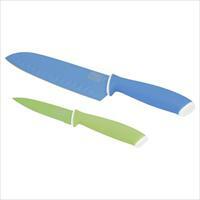 Blue 6.75" Santoku and Green 3.5" Paring Knife. Professional high-carbon stainless steel blades. Soft grip handles for comfort and control. Full Lifetime Warranty. 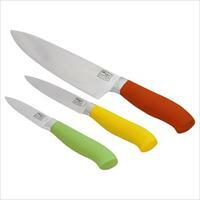 Red 8" Chef, Yellow 5" Utility and Green 3.5" Paring Knife. Professional high-carbon stainless steel blades. Soft grip handles for comfort and control. Full Lifetime Warranty. 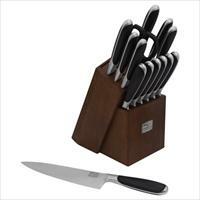 Set includes (1) 8 inch Chef;(1) 8 in Bread; (1) 5 in Utility; (1) 3.5 in Parer; (1) 3.25 in Peeler;(6) steak Knives. 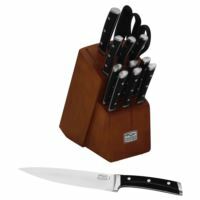 Set includes: 7.75in Chef, 7.75inBread, 4.5in Utility, (2) 3.5in parer, (6) 4.5in Steak, Shears, Steel,Cherry Wood Block. Contoured polymer handles for comfort. 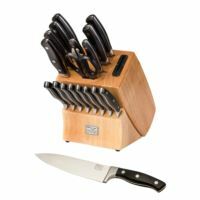 Triple-riveted handles to the blade for safety. Full metal tang provides added strength, balance, and control. The bolster keeps your fingers from running up on the blade. Forged design for increased weight and balance. Sharpened for precision cutting. High-Carbon Stainless Steel Blades: Stronger, harder blade resists stains, rust, and pitting. Hand washing recommended. Full Lifetime Warranty. 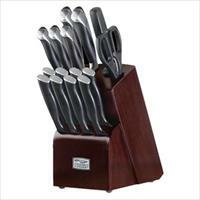 Set includes: (6) 4.5 inch Stainless Steel Steak Knives. Innovative and ergonomic handle with Responsive Touch Technology. 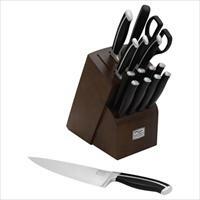 Die-cast steel bolster and handle for rigid support. German MoV Steel Blade: Superior corrosion-resistant properties, strength, and enhanced hardness. Full Lifetime Warranty. 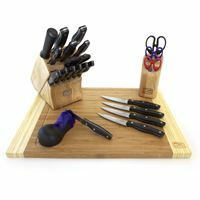 Set Includes 8" chef knife, 5" partoku knife, 5" utility knife, 4" parer, 8" bread knife, shears, wooden block with decorative faceplate and extra slots for additional knives and storage. Innovative and ergonomic handle with Responsive Touch Technology. 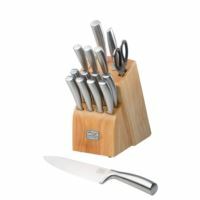 Die-cast steel bolster and handle for rigid support. German MoV Steel Blade: Superior corrosion-resistant properties, strength, and enhanced hardness. Full Lifetime Warranty. (4) 5" Steak Knives. High-carbon stainless steel resists rust and stains. Exclusive Taper Grind edge technology for optimum sharpness. Triple compression steel rivets. Full tang extends to the end of the knife. Full Lifetime Warranty. 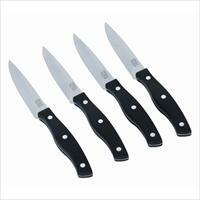 2.75" Parer, 3.5" Parer, (10) 4.5" Steak Knives. 4.75" Partoku, 5.5" Utility, 7"Santoku. 8" Sharpening Steel, 9" Scalloped, Shears. 19.5" x 13.5" Carving Board, Hardwood Block. High-carbon stainless steel resists rust and stains. Exclusive Taper Grind edge technology for optimum sharpness. Triple compression steel rivets. Full tang extends to the end of the knife. Hand-wash recommended. 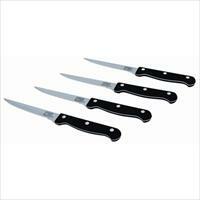 2.75" Parer, 3.5" Parer, (10) 4.5" Steak Knives. 4.75" Partoku, 5.5" Utility, 7"Santoku. 8" Sharpening Steel, 9" Scalloped, Shears. 19.5" x 13.5" Carving Board, Hardwood Block. 4-Pc Scissor Block Set, Mouse Sharpener. High-carbon stainless steel resists rust and stains. Exclusive Taper Grind edge technology for optimum sharpness. Triple compression steel rivets. Full tang extends to the end of the knife. Hand-wash recommended.